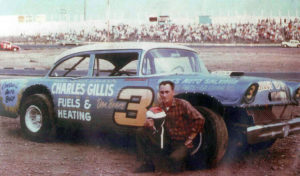 In 1965 Donnie driving his popular #3 set a record that may still be in effect, winning eight features for the season. In 1965 and 1970 he finished second in points at River Glade Speedway. In 1968 he was first in points at Shediac Speedway. In 1970 he won the Autumn Championship race. Donnie received the Most Popular Driver trophy from McEwen’s Speedway 3 years in a row, 1966, ’67 & ’68. “Beers Speeds to Four Wins. At River Glade Speedway he got his night off to a winning start by winning the third heat, the trophy dash, the third semi and the Feature”. August 26, 1967 Donnie was involved in a multi-car crash in the Main Feature sending several cars to the pits for the night, but Donnie’s car, with a smashed in door and a bent roof, returned to the track where he pulled into a commanding lead over Frank Moore of Saint John to sweep to victory. June 13, 1970 – Don Beers Puts On Another Top Display. Sizzling Donnie Beers, the veteran exciter from Moncton, put on another of his patented shows to highlight the season’s fourth card at River Glade Speedway. He won only one race but it was the Main Event. He started 14th but by the 19th lap he had taken over the lead from Walter Dunfield.